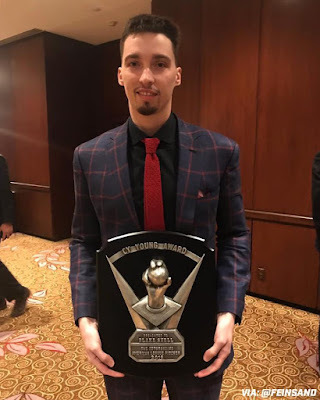 Shoreline native and Shorewood baseball star Blake Snell accepted the prestigious 2018 American League Cy Young award at the New York Baseball Writers’ Association annual awards banquet in New York City on January 27, 2019. Blake, who plays for the Tampa Bay Rays in Florida, thanked the writers and coaching staff in his remarks. The BBWAA honored outstanding performances from the 2018 season. In addition to the Cy Young, they gave awards for MVP, Rookie of the Year, and Manager of the Year. Awards are based on ballots cast by two baseball writers in each league city. The Cy Young is given to the best pitcher in the league for the year. Previous winners include Mariners' Felix Hernandez (2010) and Randy Johnson (1995).